I hope we are ready to answer this call to proclaim the message. This spring, an extraordinary thing has happened in the Episcopal Church. Over 500 people signed A Memorial to the Church which is focused chiefly on evangelism and discipleship. At this General Convention, we elected a man as Presiding Bishop who wants to be a Chief Evangelism Officer. We are building on what seemed like momentum from last convention, when both houses passed, nearly unanimously, a call to reimagine the structures of our church for this time in our common life. Are we ready to answer the call of Timothy, the summons of the Memorial, the hopes of our new Presiding Bishop, not to mention the command from Jesus himself to make disciples of all nations? There are some signs of hope here at convention. And, alas, there is also plenty of evidence that when it comes time to vote, we are reverting to places of safety and security. This is a pivotal moment, and I pray and hope we will act in a way that lives out the demands of the Gospel, the call and election of our Presiding Bishop, and the vision of the Memorial. How did it come to pass that over 30 bishops and 120 deputies and hundreds of Episcopalians who aren’t at General Convention signed this call to action? Across our church, there is a growing sense that we must answer the call to give up, to go into the neighborhoods, and to share the love of God. There is new urgency to proclaim that church must not be about comfort and familiarity, but about fearlessness and boldness. That same Memorial calls on us to fund evangelism extravagantly. The Memorial calls on us to give up our hold on old habits and egos. The Memorial calls on us to give up structures that are no longer functioning well. Are we ready? By the power the Holy Spirit, I think we can answer the call at this General Convention. Instead of saying we can’t afford evangelism, let us take risks to share the Good News of Jesus Christ with the world that is desperate for a word of hope. Instead of saying we can’t change our leadership structures because “our turf” must protected, let us practice mutual sacrifice for greater accountability and clarified roles. Instead of saying we Episcopalians don’t do church planting or revitalization, let us change our culture and become a healthy vine with new shoots of growth in many neighborhoods. Instead of saying we must maintain the status quo with horse-and-buggy structures such as provinces, let us free up resources and trust that we will still network to share success and mutual support. This is not a time for safety. This is not a time for security. This is not a time for the status quo. This is a time for fearlessness. This is a time for risk. This is a time to adapt to the changing needs of our world. Are you a deputy or a bishop? Speak up for the Gospel! Are you in Salt Lake City? Speak to Program, Budget, and Finance committee members and share with them your hopes for extravagant funding for evangelism and for ways to push us into the neighborhoods! Are you watching all this with great hope? Speak with your bishop and deputies, and urge us all to set aside our own fears and ego and make room for the wisdom and strength of the Holy Spirit. Whatever you are doing, do it today. This is the moment in Convention when we must decide if we are going to be the convention that protected the status quo or the convention that fearlessly embraced the call of the Gospel. 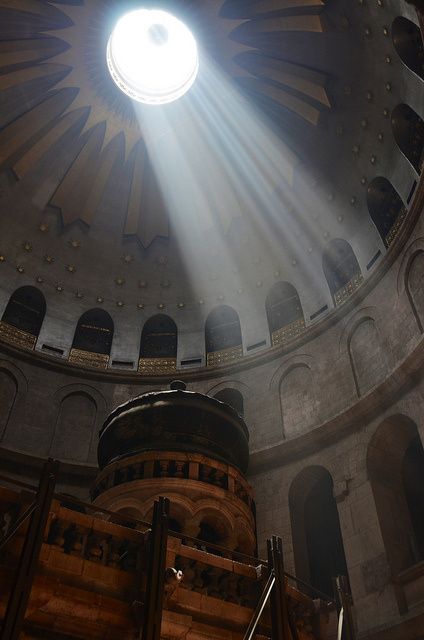 Even amidst the stench of death, the tomb was empty. Even through the shroud of fear, the Lord of Life was raised up by God. Even when it seemed impossible, God brought life where death was meant to be. Whatever seems impossible or out of reach, we can do with God’s help. We can proclaim the Gospel by our very hopes, dreams, and, yes, actions. Let us all remember the great and ancient Easter troparion as we vote and speak. Christ is risen from the dead, trampling down death by death, and on those in the tombs bestowing life. Alleluia.